DATAFARMING is inviting growers, graziers, agronomists, and anyone else who is interested to step into the world of precision agriculture by accessing for free its satellite-mapping platform. Queensland Department of Innovation and Tourism Industry Development executive director, Paul Russell, with DataFarming managing director, Tim Neale. 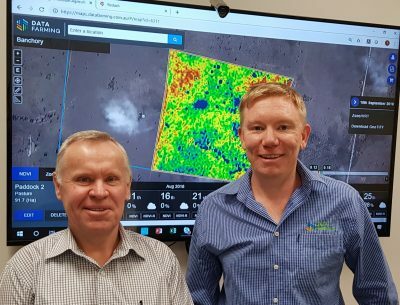 Available since early this year, it displays a new round of global satellite images every five days , and now has users looking at 5800 farms, 39,000 paddocks, and 3.45 million hectares (Mha), more than 3Mha of which is in Australia . “The uptake in grazing has taken us by surprise, and mixed farming in northern Victoria and southern New South Wales is our main user base,” DataFarming managing director, Tim Neale, said. Mr Neale said one of the most noticeable changes in maps for southeastern Australia in recent weeks indicated the tough decisions growers were now making. Mr Neale said interest in the DataFarming platform pointed to a readiness for Australian agriculture to engage with spatial mapping data. Two weeks ago, DataFarming introduced a variable-rate product which generates a controller file based off Normalised Difference Variation Index (NDVI) maps based on crop biomass, and costs users 20 cents per hectare. “It auto-zones the paddock you want, and gives you a file to put into your tractor which will dictate the amounts of fertiliser or gypsum or whatever you want to put on your paddock, in a format which is compatible with nearly all makes of machinery. The maps can indicate the need to consider management options, such as in-crop fertiliser application, spraying of fungicide, as well as assessing potential yield, moisture stress and frost damage. Mr Neale started out as an agronomist with the Queensland Department of Primary Industries in 1995, and has been in private practice since 2001 as a consultant and driver of precision agriculture across Australia and internationally. He believes the use of spatial data by growers will not displace agronomists, but will help the grower-consultant relationship generate quicker, better-informed decisions. DataFarming’s applications allow users to access technology targeting five pillars of farm productivity: crop/pasture growth; yield; waterlogging; soil variation, and weather impacts. Mr Neale said DataFarming has offered the free access to its entry-level product to encourage uptake of spatial agriculture data, and tackle the three barriers to adoption: cost of entry, ease of use, and ease of access. He said an increase in young farmers and agronomists aged 25 to 35 has been noticeable in his client base. DataFarming earlier this month won the Asia-Pacific Spatial Excellence Award for Innovation and Commercialisation, and will now go on to compete at the national level. The business has also received an Ignite Ideas grant through the Queensland Government’s Advance Queensland initiative, and Mr Neale said this would be used to accelerate the development of online precision-agriculture tools for use in the paddock. Great to see a company with a real farmer practical approach!